The Populus, Figurative Series by Craig Alan Art is an amazing visualization of artwork brought to life through paintings. 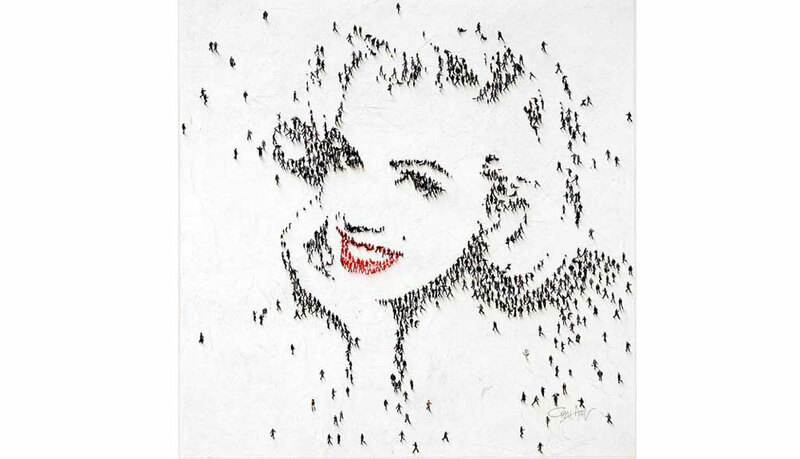 Each painting from a distance is a portrait of a celebrity – but when you look closely you see that each detail is a unique person. Whether it’s a person riding a bicycle or a box head man, you can’t help but be amazed at the details. Alan’s inspiration behind the series began when after he starting taking photos from his mother’s condo balcony on the 6th floor. In one of the photos he noticed a pattern of people forming an eye on the screen. “This started my creative wheels turning,” Alan explains. The series consists of celebrity portraits such as Marilyn Monroe, Audrey Hepburn, Abraham Lincoln, and Elvis Presley to name a few. Alan’s artwork is internationally recognized and collected by many private and prominent art collectors.